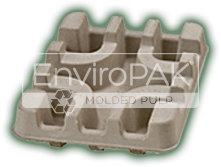 EnviroPAK’s in-house design team will develop a molded pulp packaging solution to protect and organize your product. Through years of experience, in conjunction with SolidWorks 3D CAD software, EnviroPAK can offer innovative engineering and design solutions for your particular requirement. Existing designs can be utilized in the development process to produce prototypes and production parts. Whether you need to protect and cushion your part, or simply require organization, our designers can tailor a custom solution for your application.